Hopefully this is the last of the Kenya psy-Opera posts, but I could not resist the numbers and the focus on the trinity. He said the attack had left 240 casualties, including 61 dead civilians and six of his security forces. He said five terrorists were killed and another 11 suspects have been taken into custody. He declared three days of national mourning. via Kenya president: Mall siege over, 3 mall floors collapsed. 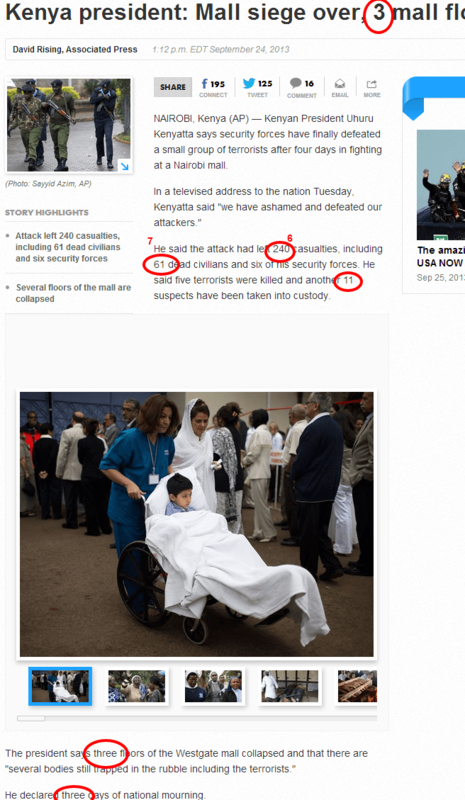 This entry was posted in Magic numbers, Psyops and tagged kenya mall shooting on September 25, 2013 by ab. JohnnyClues 5 years, 6 months ago. Canadian officials have also confirmed that at least two Canadian citizens were among the 175 injured in the attack at the upscale shopping mall. John Babcock said Monday that consular officials had been in contact with the families and continue to provide assistance as required. “For privacy reasons, we are not able to release any further details,” Babcock said in an email. A Minnesota woman identified the injured Canadians as her nieces Fardosa Abdi, 17, and Dheman Abdi, 16. She told The Associated Press that the girls were shopping when the siege started. She said Fardosa is in critical condition after undergoing two surgeries for severe leg injuries, while Dheman had a bullet break her leg and an explosion injure her arm. Hassan said the teens are Canadian citizens who moved three years ago to Nairobi, where their father has a real estate business. Several federal departments confirmed that one of the dead Canadians was Annemarie Desloges, 29, a diplomat who worked at the Canadian Embassy. Desloges was previously posted in Delhi and was off-duty, shopping at the mall Saturday when the militants attacked. Interior Minister Joseph Ole Lenku revised the death toll to 62. Kenyan officials earlier said 59 people had died since the siege began, while the Red Cross had put the toll at 68, then in a tweet lowered it to 62, saying some bodies had been counted twice. The Kenyan Defence Forces said on Twitter that 11 soldiers were injured in the battle, but that the chances of any attackers “sneaking and escaping” were slim. At daybreak Monday, military helicopters circled over the mall when about five minutes of sustained gunfire broke out inside, a clear indication that at least one of the estimated 10 to 15 gunmen who attacked the shopping centre Saturday was still on the loose. Kenyan authorities said they would do their utmost to save hostages’ lives, but no officials could say precisely how many people were being held captive. Kenya’s Red Cross said in a statement, citing police, that 49 people had been reported missing. Officials did not make an explicit link but that number could give an indication of the number of people held captive. Earlier Sunday, al-Shabaab said on its new Twitter feed — after its previous one was shut down Saturday — that Kenyan officials were asking the hostage-takers to negotiate and offering incentives. “We’ll not negotiate with the Kenyan govt as long as its forces are invading our country, so reap the bitter fruits of your harvest,” al-Shabaab said in a tweet. I haven’t looked into this one, but that link alone has sparked my interest.